October is Audiology Awareness month and the Canadian Academy of Audiology (CAA) is here to help Audiologists promote Audiology to all. Whether the topic is hearing protection in the workplace, the psychosocial effects of progressive hearing loss, the potential danger of earbuds and recreational music, or appropriate treatment for chronic balance issues; Audiologists are uniquely positioned to provide much needed information to the public sphere. This October consider lending your expertise and talents to your community to educate and inform those who might not only benefit from your services but to those who – with the proper information and protection – may never need to seek your services. Over the past year, CAA has listened to their members on improvements in marketing materials and has developed a call to action video for use in your office or clinic. Further, attendees of CAA’s Annual Conference & Exhibition in Niagara Falls this Fall, will have the opportunity to record their thoughts on what it means to be an Audiologist in their respective communities. We hope these materials will help you promote Audiology during October and beyond! The National Acoustic Laboratories (NAL) is looking for input from audiologists on the problems faced by people with unilateral hearing loss (UHL). We are exploring the needs of people with UHL, both aided and unaided, with the goal of guiding our research in this area to have as high an impact as possible. We’re interested in learning about your daily experiences in providing hearing rehabilitation for clients with UHL. The survey will take about 10 minutes, please consider participating and click on the link. 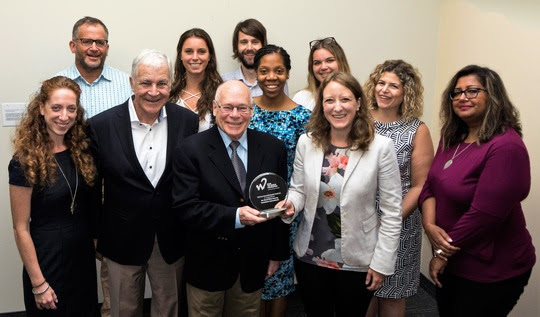 Dr. Richard Seewald, member of the Hear the World Foundation’s Advisory Board is handing over the Award to World Wide Hearing Executive Director Audra Renyi and her team. Staefa, Switzerland, August 22, 2018 – The recipient of the 2018/19 Richard Seewald Award is the World Wide Hearing Foundation International (World Wide Hearing). The annual prize by Sonova’s Hear the World Foundation honors outstanding aid projects benefiting people in need with hearing loss around the world. World Wide Hearing is a Hear the World Foundation project partner since 2016 and works towards the prevention of hearing loss and early identification of school children with hearing loss. Children with hearing loss living in low and middle-income countries often have little to no access to an audiologist, hearing health care or affordable hearing aids. Undetected hearing loss in children, even mild hearing loss, can delay the development of speech and language skills and limit school performance and can lead to a life of social isolation, poverty and higher risk of poor mental health. The Hear the World Foundation honors the professional and highly effective project work of World Wide Hearing led by Audra Renyi, Executive Director. “The 2018 Richard Seewald Award is handed over to World Wide Hearing in recognition of the exceptional leadership, expertise and passion in developing and delivering sustainable hearing health care and rehabilitation services to children in Peru”, says Prof. Dr. Richard Seewald, member of the Hear the World Foundation’s Advisory Board. “Thank you so much for this recognition! It means the world to us. Our work in Peru would not be possible without the support of Hear the World and without our Director of Programs, Youla Pompilus-Touré, and her local team who have done an outstanding job”, says Audra Renyi. World Wide Hearing implements hearing care programs to ensure that children from low-income families receive hearing health care. Children identified with hearing loss are fitted with high quality hearing aids and receive long-term care. Since 2016, World Wide Hearing with funding, hearing aids and expertise from the Hear the World Foundation, has trained local technicians, speech therapy students and volunteers (in total more than 100 professionals) to conduct hearing screenings and has screened 20’000 children. The short-term aim is to screen 30’000 children aged five to18 by March 2019. In the long run World Wide Hearing and the Hear the World Foundation are hoping the Ministries of Health and Education will take over the screening program enabling local audiologists, technicians and speech therapists to provide all children with hearing health care and access to hearing aids. The Hear the World Foundation's Award is named after Professor Dr. Richard Seewald, who is well known for his tireless efforts in pediatric audiology over many decades. He spearheaded the development of an internationally recognized DSL method for fitting hearing systems to children. Prior to his retirement, Seewald held the Canada Research Chair in Childhood Hearing at that country's National Centre for Audiology, which he co-founded. He is a Distinguished University Professor Emeritus in the School of Communication Sciences and Disorders at the University of Western Ontario and a member of the Hear the World advisory board. The annual Richard Seewald Award was developed to honor outstanding project work. World Wide Hearing Foundation International (“World Wide Hearing”) is a non-profit organization headquartered in Montreal, Canada that develops innovative models to increase access to high quality and affordable hearing aids and services to children and youth living in developing countries and underserved communities. To find out more about our projects and how we work with communities around the world, visit www.wwhearing.org/. Preschool-aged children in Regina and Saskatoon who are deaf and hard of hearing will have access to a new early learning program this fall.